i have to admit that i am pretty lucky when it comes to homework time. my children always get it done without too much complaining. however, i was starting to get pretty annoyed by the daily whining “where is a pencil” “where are my colored pencils” “i need a glue stick” “where is the sharpener!” i decide some organization tactics were in order! 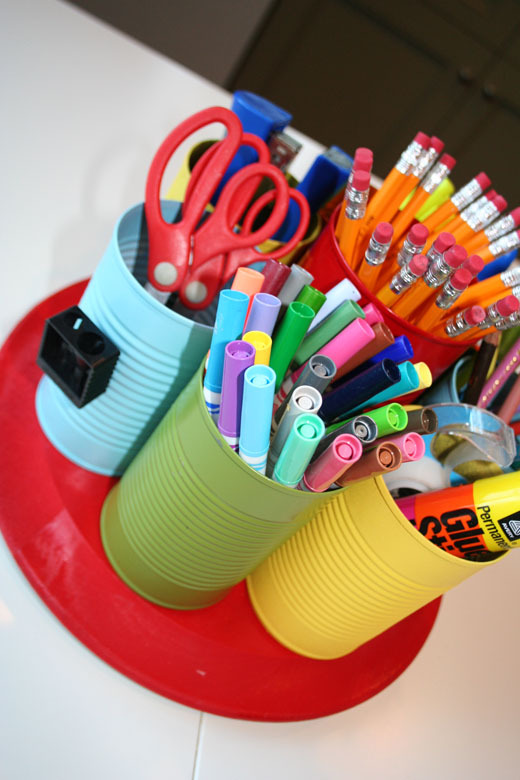 i saw a bowl full of school supplies on one of my friend’s dining room table during a visit, and thought….”why didn’t i think of doing that?”…….now that i think about it, i bet i am the only one that doesn’t have some sort of homework supply bowl or caddy of such. so, i decided to make a really cool one to put on my kitchen table….where the boys do their homework everyday. i wanted it to be fun and colorful, i wanted it to spin, and have enough space to put everything they could need to do their homework. 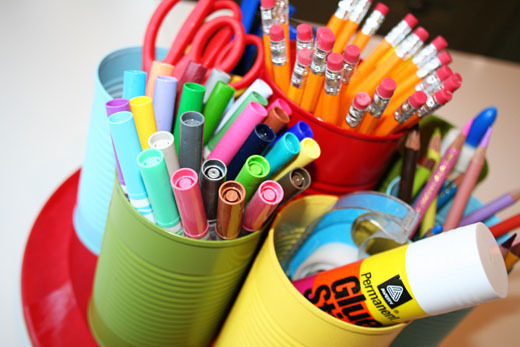 yes…i was going to make a homework supply caddy! 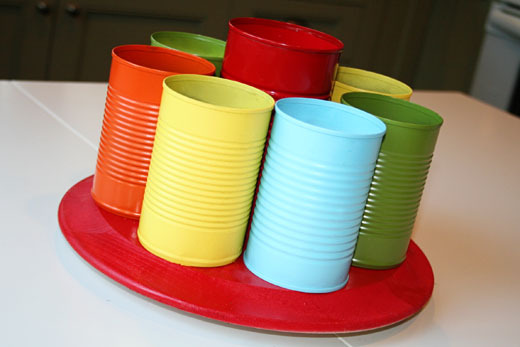 i ended up using empty cans from our canned food, a wooden circle plaque, and a lazy susan. a coat of colorful spray paint and a few screws later…..whala! 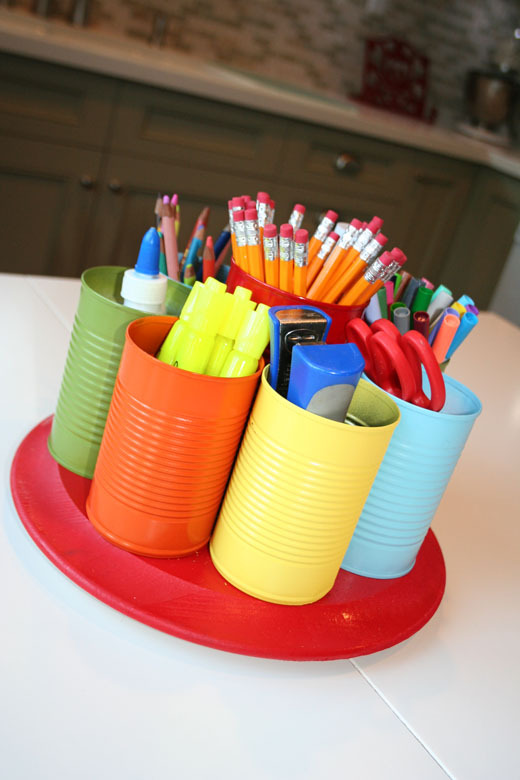 a cool homework caddy. and it sits on the table ready for homework time! 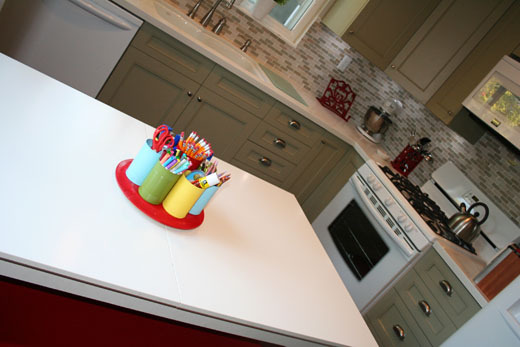 • spray paint your cans and lazy susan in the colors you like. 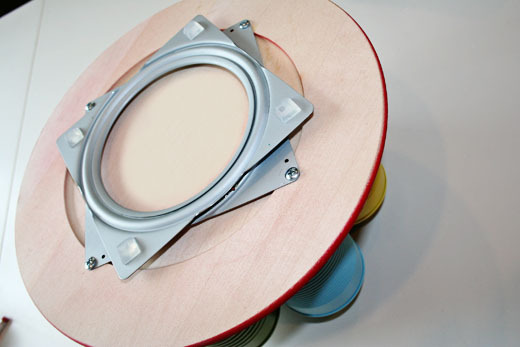 • screw the cans onto the lazy susan. the self drilling screws are so easy and go right in. • whala! you now have a cool homework caddy. fill it up with your homework supplies.